← Gypsies, Tramps, and Thieves. Allegedly. The scene: An empty two-lane highway at 8:30 pm on a Wednesday night. Behind us: A car is tailgating. For almost 15 minutes. They could easily go around us on the empty highway. A couple extra white lights come on over their roof. Then the side spotlight as seen on cop cars comes out. Within seconds a red light comes on, so I pull over. Two dimwitted Border Patrol agents creep up on the right side, stop about ten feet away, and peer towards the interior of the car, fear and suspicion on their face. ??? I think it’s been over ten years since I was stopped by police. Never once by Border Patrol. After a few minutes, they find their gonads and approach the passenger’s window. They ask who owns the car, and if I’m running drugs. Uh, no. I’m not a drug runner. They ask if they can search the trunk. Me, not being as up on the laws as I should be was ready to comply when my house guest spoke up for our rights. Then I asked the Border Patrol rookies if the stop was legal. They said yes, but got out the sniffing dog. The dog allegedly “alerted” on my trunk – as if I’m drug-running. At this point I think I’m in an episode of the Twilight Zone. When they asked me to get out of the car, I did – but not without loudly declaring that we’d just spend the last several hours hanging with snowbirds – and NO BOOZE, let alone drugs. Of course they found nothing but the wet beach towels and towing equipment I confessed to OWNING. 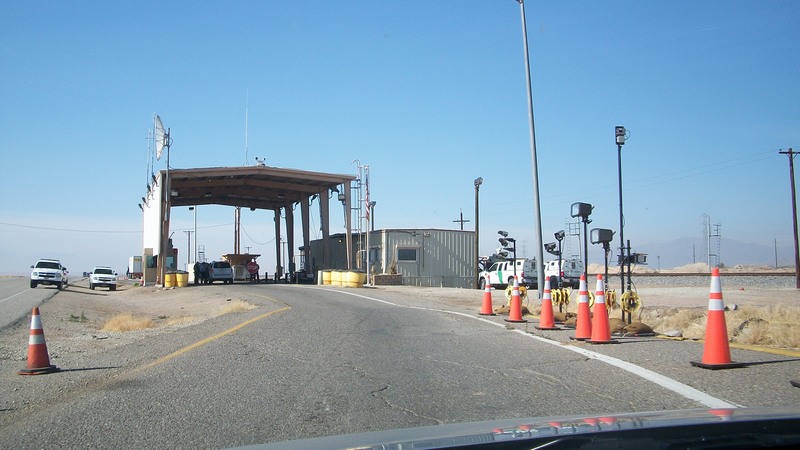 Niland Border Patrol the day after the bogus stop. Another dog sniffed the SAME car and had NO reaction. To this day, they do not know our first names, or who owns the car. At this point in my journey I feel like breaking into song… “Lately it occurs to me what a looong, strange trip it’s been.” With a nod to the Grateful Dead, for your listening pleasure I present, “Truckin’“. Since they didn’t find anything, I guess it doesn’t matter who you are. I don’t really know. I am just trying to make sense of it. They seemed like a rather senseless pair of rookies so I’ve given up trying to figure the whole thing out. Hiker Mike’s last post ..If you want something in life…. Maybe they decided I was hot enough or sweet enough – I didn’t exactly talk nice to them once they decided to search the car. Wow, those are some inept cops. I could not find an email address on here, except for you assistant (?) – I’ve had to put my blog into hiding. If you email me at (hidden to protect the innocent), I’ll send an invitation. Yes, they were. I also hear they are constantly recruiting for Border Patrol Agents. Good ones must be hard to come by.